Author: Karen Giblin and Mache Seibel, M.D. Author Karen Giblin knows her stuff: Recognizing that leadership in the menopause healthcare services arena was sorely needed, she founded Red Hot Mamas®, which has become the largest menopause management education program in the US and Canada, in 1991. Her mission: to broaden the base of women\’s knowledge about menopause and empower them to become educated healthcare consumers and active participants in the management of their own menopause. Today Red Hot Mamas is considered the largest menopause management education program in North America, delivering a variety of services which cater to the needs of this growing market. Giblin\’s programs have achieved national recognition due to their commitment to defining the pathway to good health – through advocacy, education, support and research. 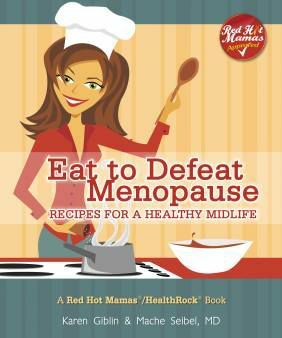 Thus the goal of the book is to teach the approximately 50 million women in the United States who are in or near menopause how to make wiser food choices, exercise, and watch their weight in order to live long and be strong. The authors come from different ethnic backgrounds, which adds to the recipe variety: Karen\’s kitchen specializes in Italian American recipes, while Mache\’s expertise is in Jewish American cuisine. They\’ve devised this book such that the first few chapters contain information about menopause, plus Red Hot Tips, useful tables and charts, “factoids” and “fictionoids,” as well as information on which foods to avoid or encourage, in order to better manage your menopausal experience. After that, the rest of the book is recipes, divided up into chapters such as: Breakfast, Appetizers and Side Dishes, Soups and Stews, Salads, Pastas, Entrees – and of course, Desserts. With over 130 recipes, so it would be hard to name a favorite. I really loved the Moroccan Chicken over Apricot-Cranberry Couscous. But then there\’s Curried Chicken and a fabulous Wild Alaskan Halibut, too. And the desserts could be “to die for” – except that they\’re healthy. You\’ll find treats like Baked Apples, Baked Alaska, and even something decadently called Dewberry\’s Triple Chocolate Brownies, which have a crunchy top and a chewy center. And with all the chocolate and nuts in them, I guarantee you\’ll never notice the addition of the healthy whole wheat flour and milled flaxseeds.